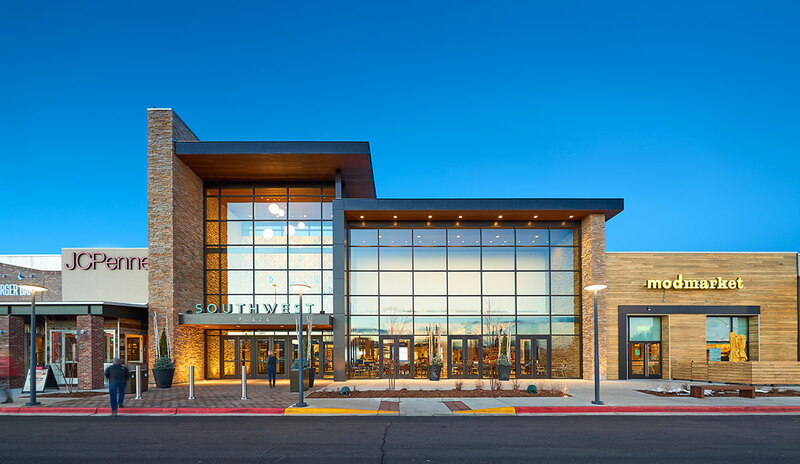 Situated in a suburb of Denver Colorado, Southwest Plaza Shopping Center needed to reinvent itself as a destination for retail. In order to attract the new leasing opportunities, OMNIPLAN and H2G worked with General Growth Properties employing their headstogether session strategy of collaboration with the full development team of designers, architect, leasing and marketing to develop and deliver a shopping experience destination unique to the community. The mall was gutted and equipped with new finishes, and updates to all four of its main entrances. Corridors were widened, skylights updated to bring more natural light into the mall, and accent lighting was added to emphasize the architectural complexities of the mall. Two new monumental fire places, new skylights and panoramic exterior windows showcasing the beautiful mountains were added to the food court, creating new social and community spaces for consumers to sit, relax and enjoy some of the unique fare, such as modmarket and Bad Daddy’s burger bar.